Often when an emergency takes place you have little-to-no warning that something is going to happen. This means that the timeframe you have to respond is extremely narrow and, in a situation where every single second counts, how you respond and how long you take to respond could be the difference between life and death. A great solution to help inform employees quickly in the event of an emergency is to invest in an alerting software system, such as DeskAlerts, to cut through digital noise in your organization and ensure that everyone is informed. 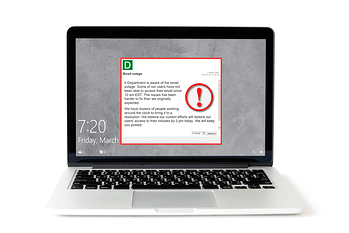 DeskAlerts works by sending a pop-up notification straight to employee computer screens, even if they are locked or in screensaver mode. Messages are delivered instantly and cannot be skipped, ignored or minimized. You can send information about what steps employees need to take such as evacuating or sheltering in-place. The alert notifications can be sent in video format or you can attach images such as maps to assist employees to find their nearest emergency exit. If you’re unsure whether an alerting solution for emergencies is the right option for your business, you can test your existing communication systems as part of your next drill to see how they stack up. If your employees are like the majority of people all over the world, there’s a good chance they won’t even see your email, it will be unopened and ignored. Some may see it and begin the process of evacuation. You will find some others tag along, confused, because they don’t completely understand what’s going on and time will be wasted as the employees who read the message explain to their colleagues who did not get it. Now imagine this wasn’t a drill and the building was on fire or there was a shooter on the loose. What would become of those employees who weren’t looking at their emails? Or those who stood around for a moment or two explaining to their colleagues what message they had received? When you send mass alert notifications everyone gets the same advice at the same time and they will know that it is official and urgent, and will be placed to act accordingly.